The World of Opal: Is Opal Really An Unlucky Stone? The shimmering opal displays a playful array of all colors - from light yellow to deep red, green and purple. It lures you in, enchants you and shows the hope of a beautiful and happy world. The name opal comes from the Sanskrit upala meaning precious jewel; the opal has been used as an adornment in a variety of cultures for a long time. However, unlike most stones, the opal has accumulated quite a bit of negative reputation. While it can be hard to pinpoint the origin of these negative beliefs, it is known that the sales of opal have significantly dropped after the 1829 publication of Sir Walter Scott's novel "Anne of Geierstein" in which the opal is presented in quite an unflattering light. 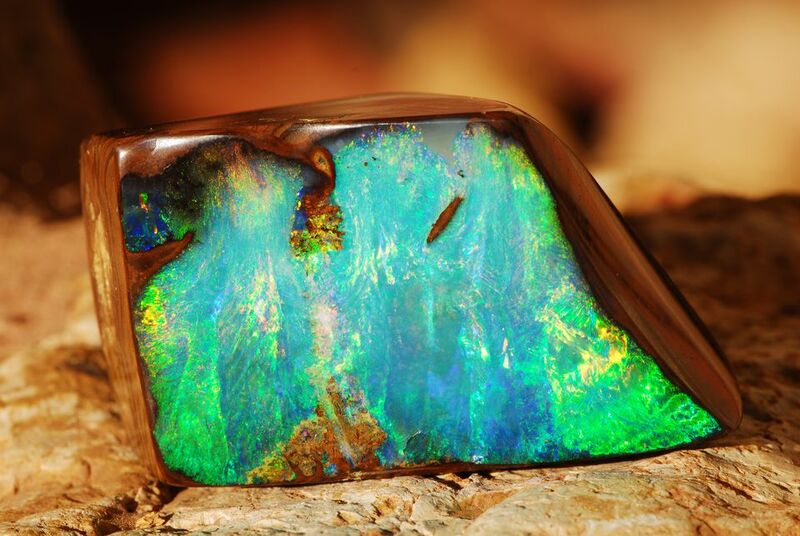 While the Western view of this mysterious stone might not be very auspicious, the opal was certainly much loved in other parts of the world, and even called the stone of Gods by the aboriginal people in Australia. Opal is a beautiful stone that can enhance one's energy and mood with a rich variety of warm colors. It can envelop you in a delicate energy of beauty and protection from negative influences. This might be the reason why one of the qualities attributed to opal in ancient times was the ability to make one invincible! The mysterious opal is quite a delicate stone (5.5-6 on the Mohs scale of hardness) and it is also prone to drying, thus the opal is best kept in a moisture rich environment. Because of its delicate nature, the opal is best suited for necklaces, earrings, pendants and brooches rather than rings and bracelets. Opal is the national gemstone of Australia for a reason; this country is the largest provider of opal stones on the market. Opal can also be found in Brazil, Indonesia, Turkey, Ethiopia and Mexico. While it can sure be hard to prove that an opal will make you invincible (as it was once believed), other qualities attributed to opal are more credible, such as balancing one's emotional state or attracting a state of happiness. The shimmering opal represents the month of October, is the birthstone of the astrological sign of Libra and the Chinese zodiac sign of Snake. What Are the Meanings and Properties of Amber? What Makes the Emerald Unique?